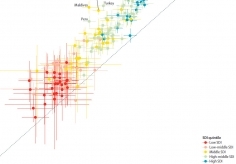 Vital registration system and cancer registry data from the EMR region were analyzed for 29 cancer groups in 22 EMR countries using the Global Burden of Disease study 2015 methodology. We used the 2015 Global Burden of Disease study for estimates of mortality and disability-adjusted life years (DALYs) of different CVD in 22 countries of EMR. 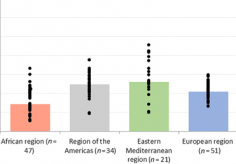 As part of the Global Burden of Disease study, we estimated diarrheal disease burden, and the burden attributable to specific risk factors and etiologies, in the Eastern Mediterranean Region between 1990 and 2015. 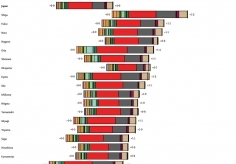 We used the results of the Global Burden of Disease 2015 study to estimate trends of HIV/AIDS burden in Eastern Mediterranean Region (EMR) countries between 1990 and 2015. We used GBD 2015 findings to measure the burden of intentional injuries in the Eastern Mediterranean Region (EMR) between 1990 and 2015. 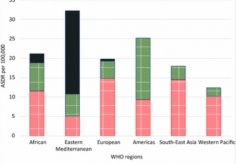 We used data from the Global Burden of Disease 2015 study to calculate the burden of lower respiratory infections in the 22 countries of the Eastern Mediterranean Region from 1990 to 2015. Assessing the burden of maternal mortality is important for tracking progress and identifying public health gaps. 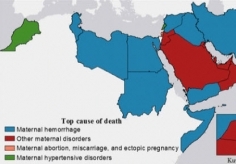 This paper provides an overview of the burden of maternal mortality in the Eastern Mediterranean Region by underlying cause and age from 1990 to 2015. 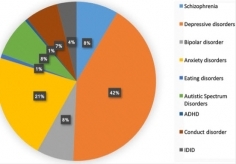 We used the Global Burden of Diseases, Injuries, and Risk Factors Study 2015 to examine the burden of mental disorders in the Eastern Mediterranean Region. We used the Global Burden of Disease 2015 study results to explore the burden of high body mass index in the Eastern Mediterranean Region. 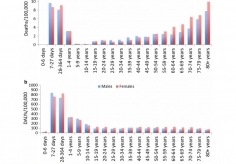 We aimed to determine the leading causes of premature mortality and disability using disability-adjusted life years (DALYs) and describe the relative burden of disease and injuries in Ethiopia. Ethiopia lacks a complete vital registration system that would assist in measuring disease burden and risk factors. We used the Global Burden of Diseases, Injuries, and Risk Factors Study 2015 (GBD 2015) estimates to describe the mortality burden from communicable, non-communicable, and other diseases in Ethiopia over the last 25 years. Japan has entered the era of super-aging and advanced health transition, which is increasingly putting pressure on the sustainability of its health system. The level and pace of this health transition might vary across regions within Japan and concern is growing about increasing regional variations in disease burden. The Global Burden of Diseases, Injuries, and Risk Factors Study 2015 (GBD 2015) provides a comprehensive, comparable framework. We used data from GBD 2015 with the aim to quantify the burden of disease and injuries, and to attribute risk factors in Japan at a subnational, prefecture level. Donor financing for malaria has declined since 2010 and this trend is projected to continue for the foreseeable future. These reductions have a significant impact on lower burden countries actively pursuing elimination, which are usually a lesser priority for donors. While domestic spending on malaria has been growing, it varies substantially in speed and magnitude across countries. A clear understanding of spending patterns and trends in donor and domestic financing is needed to uncover critical investment gaps and opportunities. In Ethiopia there is no complete registration system to measure disease burden and risk factors accurately. 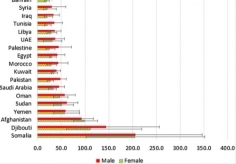 In this study, the 2015 Global Burden of Diseases, Injuries, and Risk Factors (GBD) data were used to analyze the incidence, prevalence, and mortality rates of malaria in Ethiopia over the last 25 years. 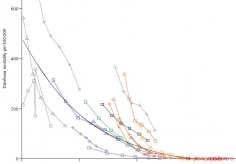 Although the rising pandemic of obesity has received major attention in many countries, the effects of this attention on trends and the disease burden of obesity remain uncertain. 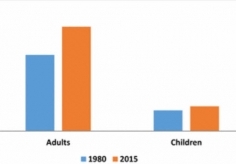 We analyzed data from 68.5 million persons to assess the trends in the prevalence of overweight and obesity among children and adults between 1980 and 2015. The Global Burden of Diseases, Injuries, and Risk Factors Study 2015 (GBD 2015) provides an up-to-date analysis of the burden of diarrheal diseases. 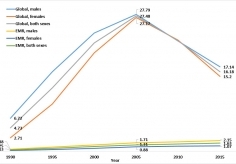 This study assesses cases, deaths, and etiologies spanning the past 25 years and informs the changing picture of diarrheal disease worldwide. 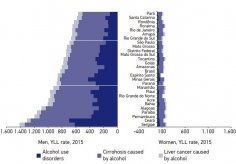 The articles of this issue of the Brazilian Journal of Epidemiology are the result of efforts to estimate and analyze the burden of disease in Brazil and in its states. National levels of personal health-care access and quality can be approximated by measuring mortality rates from causes that should not be fatal in the presence of effective medical care (i.e., amenable mortality). Previous analyses of mortality amenable to health care only focused on high-income countries and faced several methodological challenges. 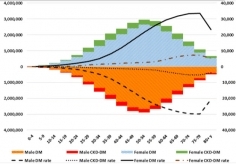 In the present analysis, we use the highly standardized cause of death and risk factor estimates generated through the Global Burden of Diseases, Injuries, and Risk Factors Study (GBD) to improve and expand the quantification of personal health-care access and quality for 195 countries and territories from 1990 to 2015. The burden of cardiovascular diseases (CVDs) remains unclear in many regions of the world. 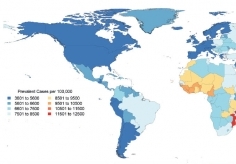 The GBD (Global Burden of Disease) 2015 study integrated data on disease incidence, prevalence, and mortality to produce consistent, up-to-date estimates for cardiovascular burden. 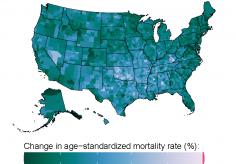 Regional variation in cardiovascular mortality is well-known but county-level estimates for all major cardiovascular conditions have not been produced. 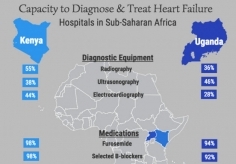 Heart failure is a major cause of disease burden in sub-Saharan Africa (SSA). There is an urgent need for better strategies for heart failure management in this region. However, there is little information on the capacity to diagnose and treat heart failure in SSA. We aim to provide a better understanding of the capacity to diagnose and treat heart failure in Kenya and Uganda to inform policy planning and interventions. Examining life expectancy by county allows for tracking geographic disparities over time and assessing factors related to these disparities. This information is potentially useful for policymakers, clinicians, and researchers seeking to reduce disparities and increase longevity. Development assistance for health targets younger more than older age groups, relative to their disease burden. 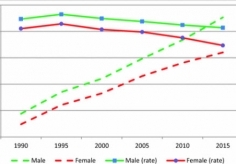 This disparity increased between 1990 and 2013. There are several potential causes for the disparity increase. 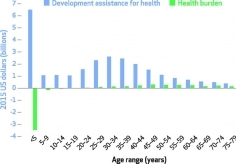 We investigated the benefits from development assistance for health by age group. Adolescence and emerging adulthood form a critical time period for the achievement of optimal health and nutrition across all stages of the life course. 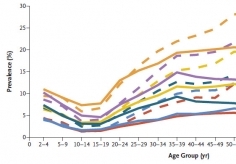 The results of this study paint a less than ideal picture of current young people's nutrition, suggesting dual burdens of underweight and high body-mass index in many countries and variable improvements in micronutrient deficiencies across geographical regions.